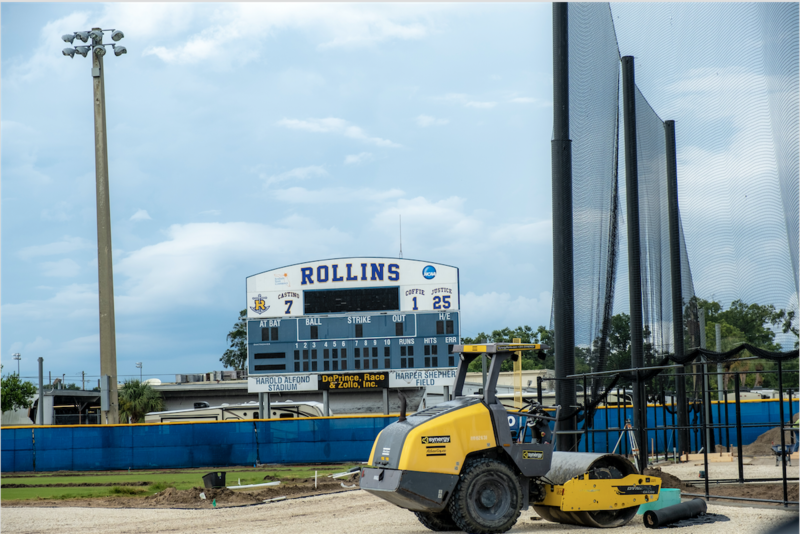 During summer break, Rollins started a series of renovations to the Alfond Baseball Stadium. These renovations, which cost a total $3 million, are designed to improve player experience both on and off the field. These renovations are scheduled to be completed by late September and should not interfere with the fall baseball season. With the addition of the junior varsity locker room, both varsity and junior varsity divisions will have access to locker room facilities. “The number of baseball players on campus has doubled in the last five years,” said Jon Sjogren, baseball’s head coach. “The synthetic surface will improve playability and give the time needed to repair and prep the field back to the players. The new turf will still require a great deal of maintenance, but the synthetic surface allows for the maintenance to be done when we choose instead of when the game and practice schedule dictates,” he said. According to Athletic Business, synthetic turf eliminates the need for fertilizers, pesticides, and water. Not only does this financially benefit the college, but it also is beneficial for the environment by conserving water and reducing environmental exposure to pesticides and fertilizers. Also, synthetic turf does not stain baseballs and uniforms as easily as natural turf; therefore, reducing the amount of times that they need to be replaced. Synthetic turf has better drainage and is less likely to become muddy This reduces the chances of baseball games being cancelled due to rainy weather. Rollins plans to improve the condition of the Rollins softball stadium in the future, according to Bitikofer. “We are working to enhance the facilities for softball at the same time,” he said. “The situation for softball is very different in that our stadium is located within the Municipal Park, therefore we must work with the city to make improvements. We are currently working to lease adjoining space to function as locker rooms in order to support the lady softball program,” Bitikofer said.